The family history begins in 1846 when Herman Kahn left his home in Bavaria, Germany, for a new life with his sister’s family in the United States. Nothing is reported until Herman Kahn (now changed to Cone) opened a wholesale grocery business, H. Cone & Sons, in Baltimore in 1870. His two oldest sons, Moses and Ceasar, travel through the south taking orders from general stores, and bartering textiles for groceries. 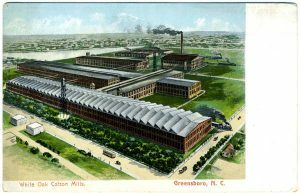 In 1887, the sons invest $50,000 in C. E. Graham Manufacturing Co., in Asheville, the first textile investment. As the plaid business of people like the Holts grew, they arranged for Cone to represent them in far-flung markets. In 1891, the Cones form Cone Export & Commission Company. 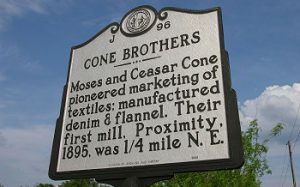 In 1895, the brothers Moses and Ceasar decide to go into the textile business for themselves when denim supplies from Erwin Mills and others become unstable for their marketing business. They began to make durable denim in their new Proximity Manufacturing Mill located in Greensboro. 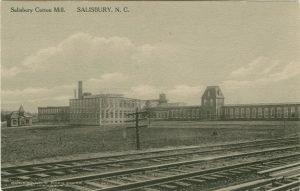 The name was given because of the close proximity to North Carolina cotton, gins, warehouses and the North Carolina Railroad that passed from the east and continued westward toward Charlotte with connections to Atlanta and northward to markets in Baltimore and New York. 1899. The Cones join Emanuel and Herman Sternberger in establishing Revolution Cotton Mills to manufacture cotton flannel. 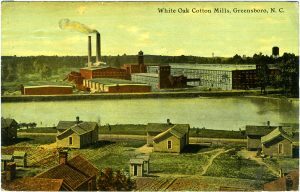 The mill was so modern it “revolutionized” cotton manufacture. 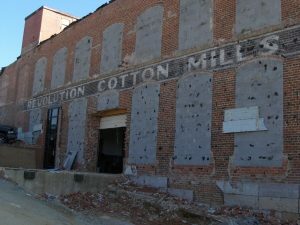 Revolution Cotton Mill building undergoing renovation for NC A&T University research March 2008. 1905. The White Oak plant, named for a huge 200-year old tree on the property became one of the largest indigo dyeing operations in the world, requiring ten warehouses and its own power plant. The Cones built entire towns including Christian churches even though they were of the Jewish faith. A new site (2009) shows vintage White Oak photos. You can subscribe to changes at the site. 1908. 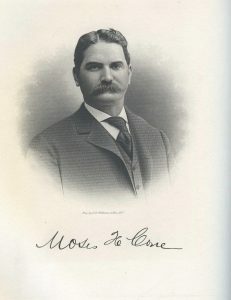 Moses H. Cone dies. Ceasar Cone, President. 1912. Expansion at the Proximity works with the first printing machine in the south. Printed flannels becomepopular. 1915. By now the Cones were making denim for the Levi Strauss jeans. 1917. Ceasar dies and the younger brothers, Julius and Bernard, assume leadership of the business. The company grew and diversified from denim into other fabrics. 1920. Salisbury Cotton Mills added to the Cone business. 1927. The Cliffside and Haynes Mills are purchased. 1928. Granite Mill, Haw River, bought and later converted to corduroy production. 1938. 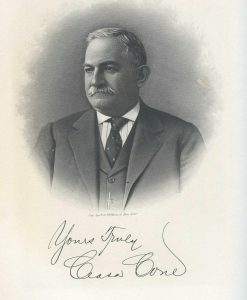 Herman Cone, named President when Bernard dies. 1941. Marketing moved to New York City. Huge war effort earns the company the coveted Army-Navy “E” award for high achievement in production. 1945. All textile mills united under the name Proximity Manufacturing Company. 1948. 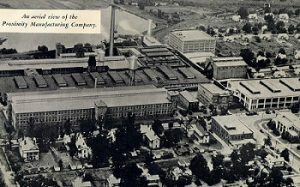 Cone Mills Corporation formed with the merger of Proximity Manufacturing and Revolution Print. In 1951, Cone went public at $28.58 a share with a listing on the prestigious New York Stock Exchange. 1955. The Carlisle, SC plant on the Broad River south of Spartanburg opened. This grew to be a huge modern dyeing, printing and finishing plant. 1956. Herman dies, Benjamin Cone, Sr. named Chairman, Ceasar II President. In the 1950s and ‘60s, Cone added corduroy to the product line at the Haw River Plant. Permanent press fabrics were added. After a warehouse flooded and damaged denim they ran the goods through a bleach bath to remove dye and created a “Pinto Wash” denim. A fashion trend was begun which continued for years with specialty denims. 1961 Diversification by acquiring Olympic Chemical Co., manufacturer of polyurethane foam for furniture and decorative fabrics added with the acquisition of John Wolf textiles. 1965. Ceasar II, Chairman. Lewis S. Morris President and CEO. 1971. Cone purchases Prelude Company, a High Point manufacturer of luxury cushions. 1973. Ceasar II steps down, Lewis S. Morris Chairman and CEO. 1974. Olympic Products expands by acquiring the South Aire polyurethane plant in Tupelo, MS.
1975. A new Cliffside weave plant was built as the original Cliffside plant was converted to denim. 1980. Prelude’s cushion operation moves to a new plant in Thomasville. 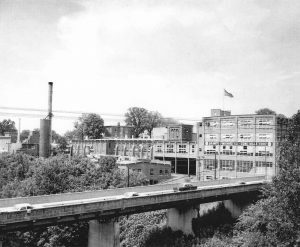 The High Point plant is converted to make fiber batting and filling. Chemical Chair acquired. 1981. 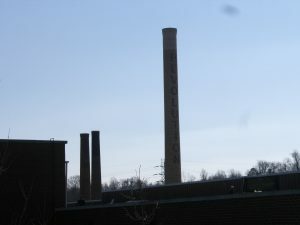 Cone named Textile World magazine “Model Mill” for the year. New plant for Chemical Chair; business name later changed to Conitron. 1983. Hostile takeover attempted and dismissed by going private with a leveraged buyout. 1984. Awarded ATMI “First in Safety” award. 1990. J. Patrick Danahy, President and CEO. 1991. A Century of Excellence celebrated. The company grew from Cone Export in 1891 to be the major producer of denim and corduroy in the world. 1990s Cone struggled but was still the largest producer of denim in the world as the 21st century began. Finally, shrinking profits brought about by the worldwide shift in manufacturing to the lowest cost producers forced the King of Denim into bankruptcy. In 2004, Cone was acquired by W. L. Ross & Co., and now operates along with the assets of the former competitor, Burlington Industries, as a part of International Textile Group. 2008 Thomas E. McKenna succeeds John L. Bakane as president of Cone Denim, division of ITG. 2008 Cone Denim Nicaragua has received a syndicated loan of up to $37 million to complete a 600,000 – square-foot vertical manufacturing facility near Managua. Hines, Caroline R. 1991.Cone: A Century of Excellence, Cone Mills Centennial Committee, Greensboro, NC. Andrews, Mildred Gwin, 1987. The Men and the Mills – A History of the Southern Textile Industry, Macon: Mercer University Press. News: Cone Denim Names McKenna to Lead, Nets Funding for Nicaragua Plant, Textile World, January/February 2008, p12. Cone Denim survives making classic denim for high-priced jeans.